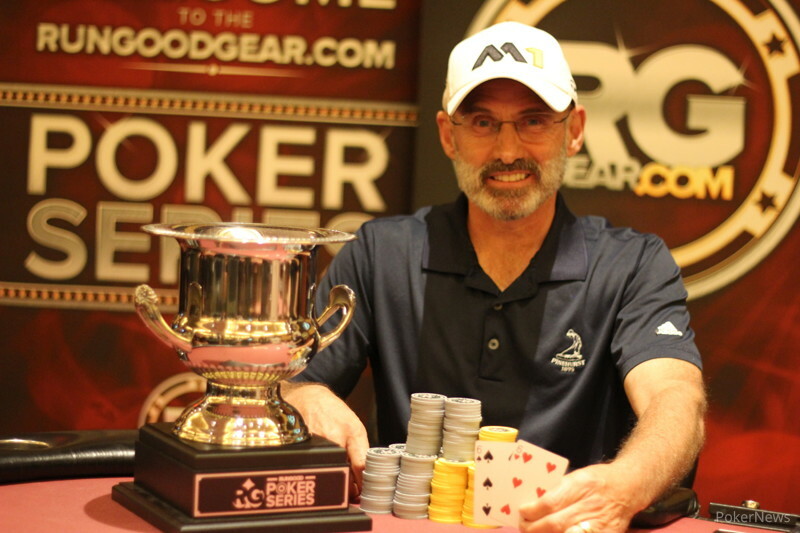 Mike Sortino is the first $1,100 Main Event champion on the RunGood Poker Series. He earned his largest ever live cash — $40,320 — and will get his name etched on the RunGood Champions Cup after topping a 144-player field at RunGood Horseshoe Council Bluffs. After two Day 1 flights that both hit hard stops with 13 players left, a total of 26 runners returned to the Horseshoe for Day 2 on Sunday morning. Fifteen of those players would be paid, and Matt Anderson, Clint Lilienthal, Terry Karn, and RunGood Pro and two-time RPS champ Ryan Tepen were among those falling before the money bubble burst. Tepen's fellow RunGood Pro, Michael Sanders, dominated proceedings early on before fizzling in a big way with two tables left. Much of his stack went to Russell Licking, who finished Sanders on a flop with against when Sanders failed to improve. Licking busted Kipp Smith with against and took a dominating lead into the final table with almost 40 percent of the total chips. Shortly after the final table began, Licking got the final RunGood Pro standing, Justin Gardenhire, shoving over his river bet on a completed board of . Gardenhire couldn't get away from his hand and mucked when Licking showed for a wheel. While Licking continued to crush, former RunGood Council Bluffs champ Brandon Fish found his groove. 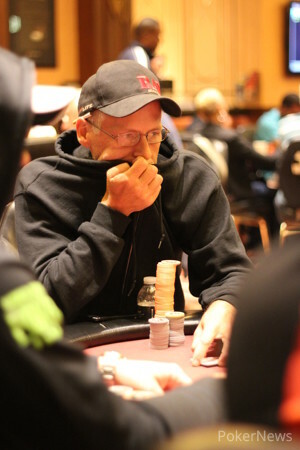 After nursing a short stack for much of Day 2, he won a number of pots at the final table to move up the counts and threaten another victory. However, it wasn't to be, as he found himself short again after the elimination of Phil Mader in fourth. Fish jammed 204,000 at 12,000/24,000/4,000 with and had Sortino wake up with aces behind him. Fish flopped one pair but found no further improvement on the board. Moments later, Thomas Houston got his stack in with on a flop of and found himself trailing Sortino's . An turn and river meant Sortino had a straight, and for the first time in hours, someone had wrested the chip lead from Licking. Licking and Sortino played a high-variance heads-up affair, with Sortino at one point at risk after overbet jamming with on a and getting called by Licking, who had . The river brought a to save Sortino's tournament life and he wouldn't relinquish the lead from there. On the final hand, he raised to 105,000 when Licking limped in at 15,000/30,000/5,000. Licking called and the two saw a flop. Sortino checked and saw Licking move all in for around 700,000. That was exactly what Sortino wanted as he had for a set. Licking's was in awful shape and a brick turn sent Sortino the pot and the tournament. Russell Licking called the blind, and Mike Sortino made it 75,000 more to go. Licking called, and Sortino checked to him when flopped. Licking jammed about 700,000 in, and Sortino quickly called. Licking was in awful shape against the set, and the turn sealed the deal before a meaningless hit the river. Mike Sortino raised to 260,000 when Russell Licking bet 60,000 into him on a board. Licking called, and the river was an . Licking checked and eventually folded to an all-in shove. With the pot containing over 250,000 preflop, Mike Sortino jammed for 872,000 on a flop. Russell Licking considered briefly and announced a call. Sortino needed a king or a ten to keep the tournament from ending, and he got one on the river after an bricked on the turn. Russell Licking bet 150,000 on the turn with the board reading . Mike Sortino called. Licking moved all in on the river, and Sortino called fairly quickly. Licking's two pair was good and the dealer counted down 687,000 in his stack. For the first time in quite awhile, Russell Licking does not hold the chip lead. 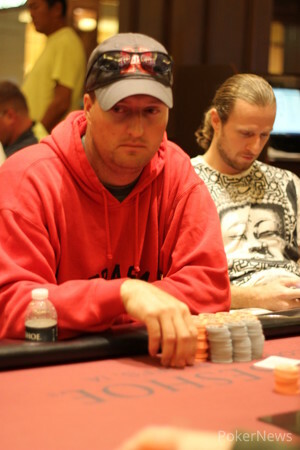 Thomas Houston and Mike Sortino got stacks in after flopped, with Houston holding and Sortino . "Give him two pair," Houston urged. Instead, it was Houston hitting two pair on the turn, and the river left Sortino's straight best. He collected Houston's remaining 400,000.